UPDATE: THANKS to a sudden gust of wind an Austrian daredevil will have to wait hours, days, or even weeks for his next chance to make an unprecedented leap from the edge of space, setting records as he breaks the speed of sound in freefall above New Mexico. Felix Baumgartner was to ascend 120,000 feet - about 36 kilometres - in a capsule taken to the edge of the stratosphere by a helium balloon, before stepping out in a pressurised suit to fall back to earth. The jump was initially due to take place on Monday, but was then delayed by 24 hours due to weather. It was further delayed overnight. Shortly before 11am local time (4am AEDT) Baumgartner entered his pressurised capsule in Roswell, New Mexico and crews began filling the 55-storey-high balloon. 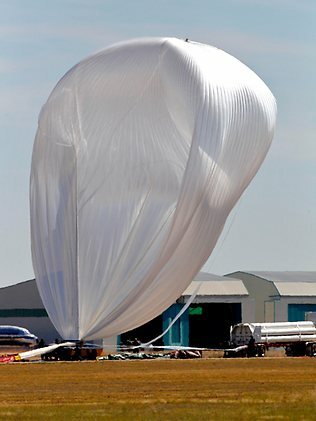 However gusty winds began blowing the delicate balloon around as it inflated, and the launch was aborted minutes before it was due to take place. "Today's launch has been aborted .. due to wind gusts making an attempt too risky," said a statement on the Red Bull Stratos mission's website, while spokeswoman Sarah Anderson told AFP no new attempt would be made on Tuesday. Retired US Air Force Colonel Joseph Kittinger, who holds three of the records Baumgartner is trying to break, could be seen shaking his head and looking upset in the mission control room. There was no immediate word on when a new attempt could be made. Media reports suggested that weather conditions are set to deteriorate in the coming days. 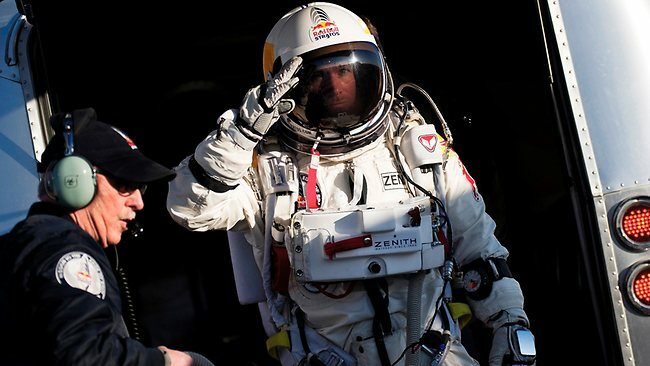 The Red Bull team Tweeted: "The Red Bull Stratos launch today was aborted due to strong winds. We'll keep you updated on possible new launch days." WHAT is the worst thing that can happen when you free fall from the edge of space? Well, if your hi-tech super suit rips, your skin will boil. 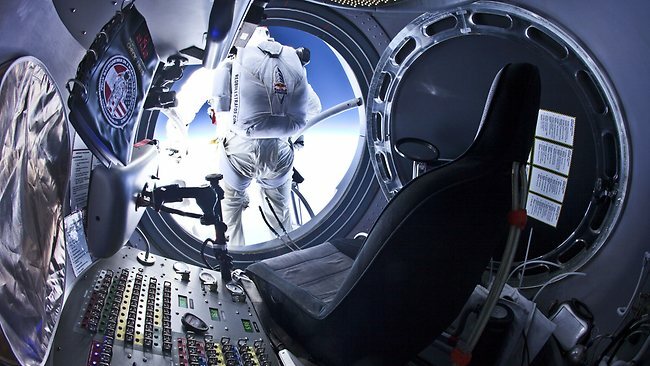 Once conditions are just right, Felix Baumgartner will stand on the edge of a platform 36.5km above the Earth and take the plunge for a record five years in the making. The 43-year-old will let go of the handrail and jump, reaching speeds of 1100km/h in a six-minute thrill ride before a parachute opens and gently brings him down to Earth. That's if everything goes to plan. History has shown us that when things do go to plan on extreme expeditions, the world takes notice. Neil Armstrong placed his left boot on the surface of the moon 43 years ago, something that humanity will never forget. In 1953 Sir Edmund Hillary climbed Mt Everest and through his efforts, was named as one of the most influential people of the 20th century. Rewind further to 1860, when Robert O'Hara Burke and William John Wills travelled more than 3250km across Australia, ultimately giving their lives for what is recognised as one of the most important explorations in our nation's history. But when Armstrong famously said those words, "That's one small step for man, one giant leap for mankind", little did he know that just over four decades on, Felix Baumgartner would enact Armstrong's words. On the other hand, the nightmare scenario that could unfold this evening has been likened to a horror film. His blood could boil, brain burst and even cause his eyeballs to pop out - all of it while the feat unfolds live around the world. But Baumgartner is no stranger to taking leaps of faith. 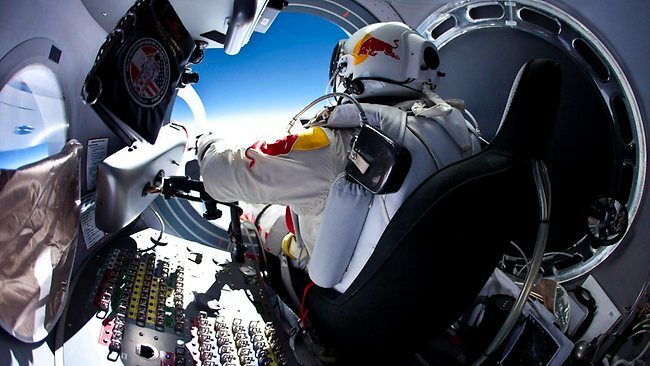 Red Bull Stratos jumper Felix Baumgartner. A world-renowned Austrian skydiver, BASE jumper and daredevil, he is best known for flying across the English Channel with a carbon wing. He has jumped from the Petronas Towers in Kuala Lumpur and the Christ the Redeemer statue in Rio de Janeiro, not to mention Taiwan's Taipei 101 tower and Millau Bridge in France. But this mission, to be launched from Roswell, New Mexico, has upped the ante. It all starts in a capsule no bigger than a VW beetle attached to a helium balloon, lifting him into the stratosphere in a journey that should take just under three hours. "Space is jet black. 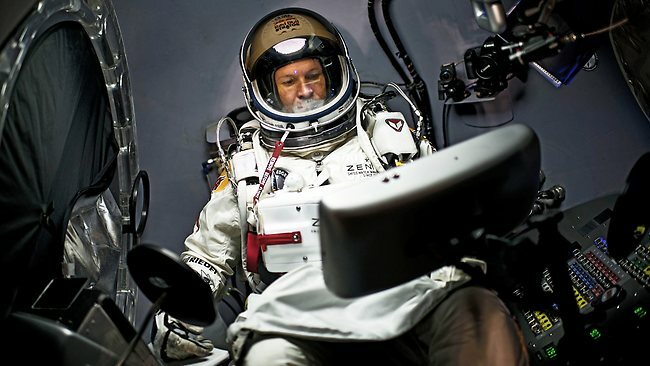 You can see the curvature of the Earth," Baumgartner says. "This is the moment when you realise just how lucky you are to be up here standing on the platform of the capsule. Then you release your grip on the handrails and fall, just as you'd envisaged it a million times before." Baumgartner says he faces fear every day. "Fear has become a friend of mine. It's what prevents me from stepping too far over the line," he says. "Having been involved in extreme endeavours for so long, I've learnt to use my fear to my advantage." Dr Jan Lewis, an expert in extreme sports and high risk sports says Baumgartner is very aware of the risks involved and that's the attraction of doing a jump like this. "He's calculated his odds of survival and he would not do it unless he thought he would survive," Dr Lewis says. "He's not doing this on a whim. It's years and years of preparation." Dr Lewis adds that there are certain thrills people sought that couldn't be found elsewhere - such as with Richard Branson's recent entry into the business of adventure space flights. "A lot of people have pre-booked on the off-chance it happens because it's something they want to experience. This is another example of people wanting to take things one step further, like Felix Baumgartner." However calculated Baumgartner's attempt may be, Dr Lewis says there is always the risk of the unknown, which could lead to tragedy. "There is always the risk of the unknown and something that is not your fault," she says. "There's a lot of factors that can't actually be factored in. He's tried to minimise the risk as much as he possibly can but there's always things that can go wrong." There will be the cynics who play down the importance of the feat. They will suggest he is just a crazy person risking his life for the next adrenalin fix? An Australian, from Lennox Head on the north coast of NSW, couldn't disagree more. 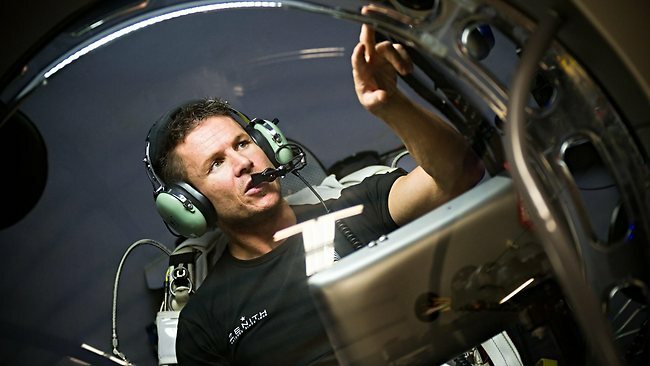 Andy Walshe has supported Baumgartner through every stage of his training. He was touted as the saving grace of the US Olympic snow team when he joined in 1999 by introducing training models that resurrected their campaign. And he rates Baumgartner up there with any sportsman. "It's kind of amazing how focused and deliberate he is with what he does," Walshe says. "He's more involved than most Olympians I've worked with. "He comes from this space where you sit down and meticulously plan everything, and you don't leave anything to chance." After being put through physical, nutritional, psychological and medical evaluations, Walshe says Baumgartner is in prime condition. "We prepared him on the cardio work to get him more efficient because there is the fitness needed to do the jump, but there is a different fitness to get through all the preparation," he says. "We had to sharpen him up and get him moving in the suit, moving through those motions which allowed him to sustain the concentration." A psychologist was also brought in to help Baumgartner through the apprehension. "We worked through very simple things and spoke to him about his legacy, his growth as an individual and as a human and how he wanted to be remembered," Walshe says. And tomorrow, Baumgartner will live out a dream beyond the realms of what most of us will ever do. Does that make him crazy? "When you work with these people, they'll say, if you're not doing what you love, if you're not living your dreams, then that's crazy. "This guy has a dream to do something no one else has done."